A wedding ring or wedding band consists of a metal ring. In certain countries it is worn on the base of the left ring finger. In other parts of the world, it is worn on the right ring finger (see post-wedding customs below). Most religious marital ceremonies accept a band of any material to symbolize the making of marriage vows. To make wedding rings, jewellers most commonly use a precious yellow alloy of gold, hardened with copper and silver or tin and bismuth. Platinum and white alloys of gold are also used, although the slightly yellow “white” gold alloys of the past have been largely replaced by a cheaper nickel-gold alloy, covered with a thin plating of rhodium which must be reapplied after some years of wear. Titanium has recently become a popular material for wedding bands, due to its durability, affordability, and gunmetal grey colour. Tungsten carbide, often with gold or platinum inlays, is recently being used as well. The least expensive material in common use is nickel silver for those who prefer its appearance or cost. Marrying couples are also beginning to use stainless steel, which has the same durability as platinum or titanium, and can accept a finer finish than the latter. 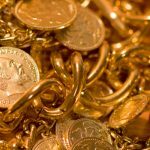 Silver, copper, brass and other cheaper metals do not occur as frequently because they corrode over time and thus do not convey a sense of permanence. Wood, Stone and Organic materials can also be used but are more decorative and much less durable than metal. A plain gold band is the most popular pattern. Medical personnel commonly wear it because it can be kept very clean. Women usually wear narrow bands, while men wear broader bands. Some couples choose to design their own wedding rings. In France and French-speaking countries, a common pattern consists of three interwoven rings. They stand for the Christian virtues of “faith, hope and love”, where “love” equates to that particular type of perfect disinterested love indicated by the ancient Greek word agape. Provocatively, this pattern slides off quickly, because the rings flow over each other. Women in Greek and Anatolian (comprising most of modern Turkey) cultures sometimes receive and wear puzzle rings – sets of interlocking metal bands that one must arrange just so in order to form a single ring. Traditionally, men wryly gave them as a test of their woman’s monogamy. In North America and some European countries, many married women wear two rings on the same finger: an engagement ring and a plain wedding band. 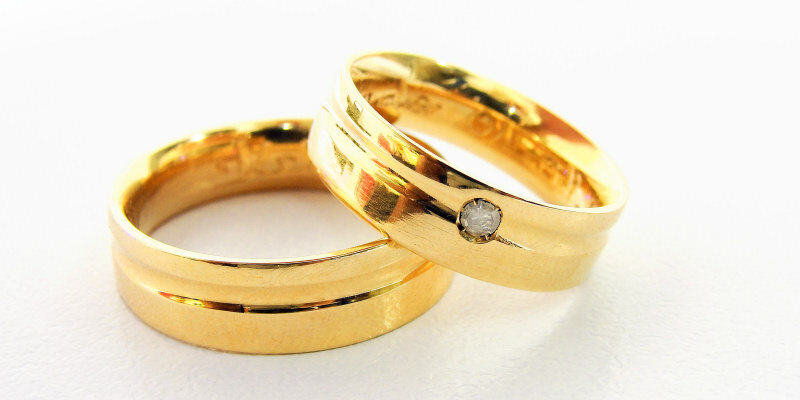 Couples often purchase such rings as a pair of bands designed to fit together. In addition, some women who have been married a long time wear three rings on their finger (from hand to tip): a wedding band, an engagement ring, and an eternity ring. This three-ring combination is especially common in the UK.